Marketing your business through social media isn’t an option these days—it’s absolutely imperative. 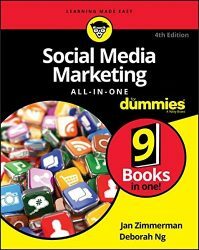 In this new edition of the bestselling Social Media Marketing All-in-One For Dummies, you’ll get comprehensive, expert guidance on how to use the latest social media platforms to promote your business, reach customers, and thrive in the global marketplace. Don’t get left behind! Let this book help you get the most from every minute and dollar you spend on marketing.